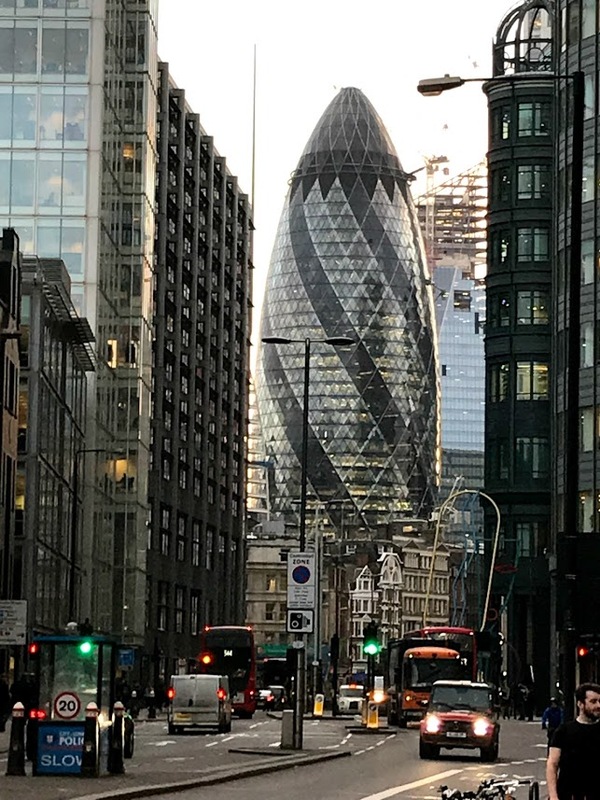 Despite the moves towards Brexit, the City of London remains one of the world’s financial capitals, displaying money, power and wealth and with some of some of Europe’s tallest towers – 99 Bishopsgate, Tower 42 and 30 St Mary Axe. The City of London is one place. One of the most recognisable modern buildings in the City, because of its unusual, innovative, shape, is known as the Gherkin. This is the popular name of 30 St Mary Axe, previously the Swiss Re Building. It has become a major feature of London’s skyline and is one of the city’s most widely recognised examples of contemporary architecture. The Gherkin was completed in December 2003, opened in April 2004, and is 41 storeys or 180 metres high. It stands on the sites of the former Baltic Exchange and Chamber of Shipping, both extensively damaged by an IRA bomb in 1992. The original plan was for a 92-storey Millennium Tower, but when these plans were dropped Norman Foster and the Arup Group designed the Gherkin. 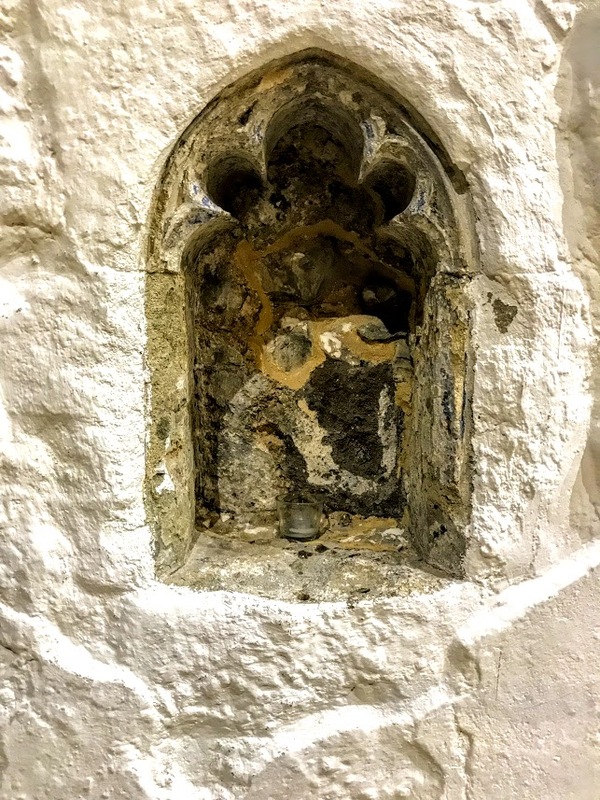 Tucked beneath the shadows of the Gherkin and the other tall buildings of the City, Saint Ethelburga-the-Virgin within Bishopsgate is one of the few surviving mediaeval churches in the City of London. 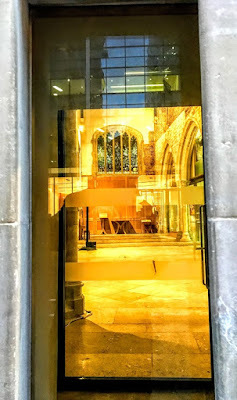 The church projects right onto the footpath on Bishopsgate and is near Liverpool Street station. The foundation date of the church is unknown, but a church dedicated to Saint Ethelburga has stood on this site for at least nine centuries. This one of the few mediaeval City churches not destroyed in the Great Fire of London in 1666, and it continued to stand during the Blitz and World II. 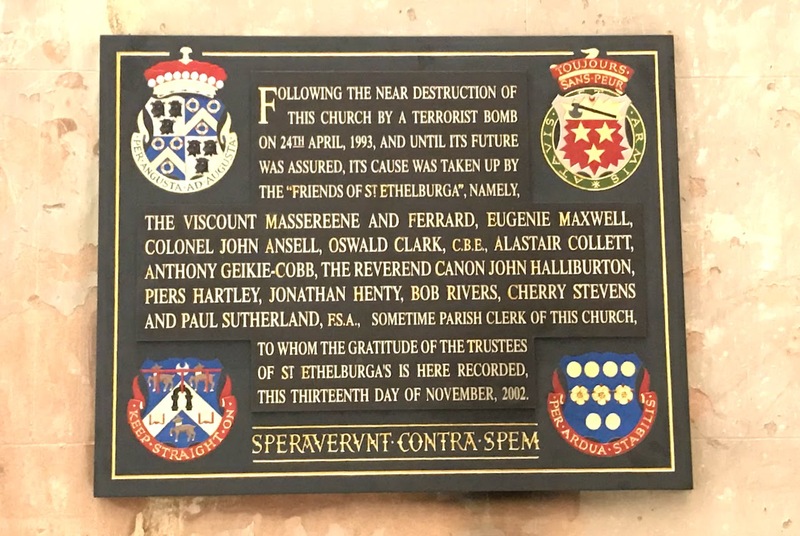 But 25 years ago, on 24 April 1993, a massive IRA lorry bomb exploded in Bishopsgate, severely damaging the church and devastating much of the surrounding area. 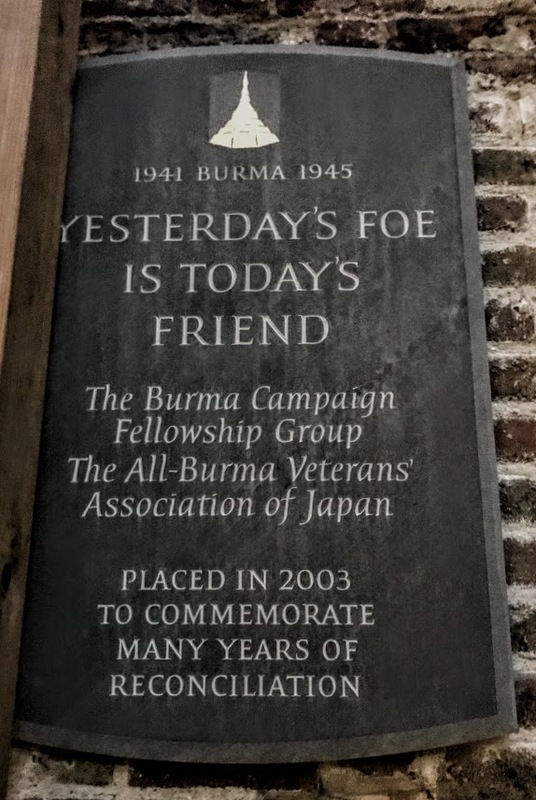 In the quarter century since then, the church has been rebuilt and restored, and it is now a Centre for Reconciliation and Peace. Saint Ethelburga, who gives her name to the church, the seventh century Abbess of the great Benedictine Abbey in Barking, Essex. 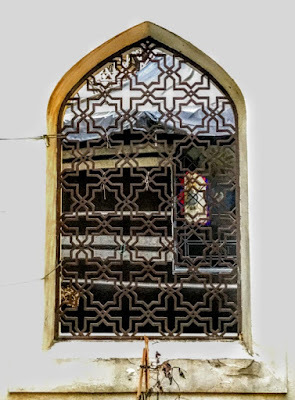 This was one of the first religious houses for women in England and was founded by her brother, Saint Erkenwald. She is thought to have been born at Stallingborough near Grimsby. When she refused to marry Edwin, the pagan King of Northumbria, she was banished to a nunnery. Later, she was known for her heroic work in caring for the sick during an outbreak of the plague in 664. She is said to have had a vision of a light ‘brighter than the sun at noonday’ that inspired her and her community to care for people in works of great compassion. The plague eventually killed her and most of her community. Bishop Erkenwald later became Bishop of London and gave his name to Bishopsgate, and he died in 693. 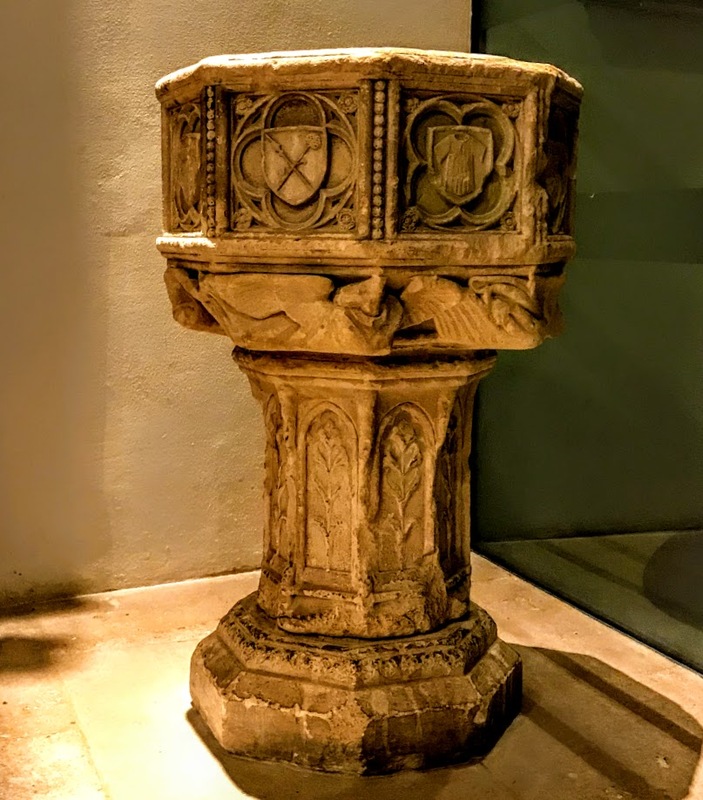 The church may have been founded at this time. But its foundation date is unknown, and it was first recorded only in 1250 as the Church of Saint Adelburga-the-Virgin. The church was rebuilt in the 15th century, around 1411-1450, and some of that fabric remains, including the south arcade. The late mediaeval parish covered just three acres (12,000 sq m). To generate extra income for the parish in the 16th century, a wooden porch was built outside to house two shops, perhaps an early example of social enterprise in the church. John Larke, Rector of Saint Ethelburga’s from 1504 to 1542, was a friend of the ‘man for all seasons,’ Thomas More. When he refused to subscribe to the Act of Supremacy, he was martyred on Tyburn Hill on 7 March 1544 – the only priest to suffer this way in the reign of Henry VIII. The explorer Henry Hudson and the crew in the Half Moon took Communion here in 1607 before setting sail in search of the North-West Passage and a route by the North Pole to East Asia. At the time, the Rector was William Bedwell (1561-1632), a Cambridge scholar who was learned in Arabic and mathematics. He was a member of the committee that translated the first 12 books in the King James or Authorised Version of the Bible. During Puritan times, the suffix ‘-the-Virgin’ in the dedication of the church was removed, perhaps in the mistaken belief that this referred to the Virgin Mary. 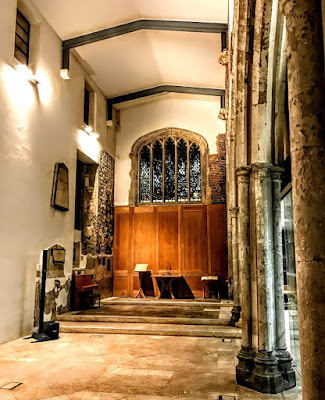 But it was restored after the restoration of Charles II, and the church was one of the few mediaeval City churches to survive the Great Fire of London in 1666. A weathervane was added in 1671, and a small square bell turret in 1775. The 19th-century font is inscribed with the longest-known palindrome in Greek: Νιψον Ανομηματα Μη Μοναν Οψιν, ‘Wash the sins, not only the face.’ The phrase is attributed to Saint Gregory of Nazianzus and was inscribed on a font outside the great church of Aghia Sophia in Constantinople. 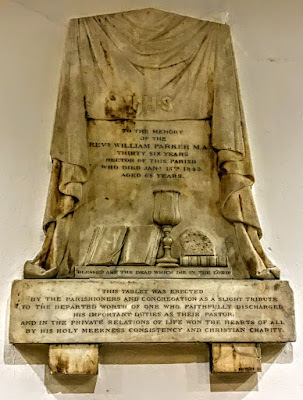 The Revd John Medows Rodwell (1808-1900), who was rector throughout the Victorian era (1843-1900), remained a friend of Charles Darwin from their student days together in Cambridge. He made the first reliable translation of the Qur’an into English (1861) and is still highly regarded as a non-Muslim Islamic scholar. The church furnishings were changed at least twice in the 19th century, reflecting changing styles of worship and liturgy. The church was re-ordered once again in 1912 by Sir Ninian Comper, but none of his furnishings has survived. The church underwent major changes when Bishopsgate was widened in 1932. The 16th century shops were demolished, and the porch was dismantled, revealing the façade of the church for the first time in centuries. 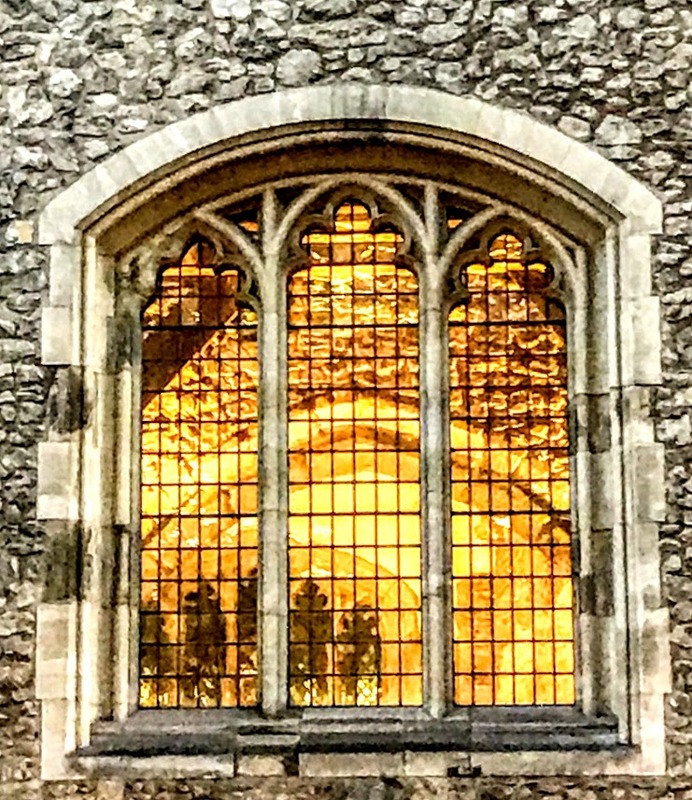 Saint Ethelburga’s gained notoriety in the 1930s as one of the few churches in which divorced people could remarry, in defiance of the Bishop of London. The Revd Dr William Frederick Geikie-Cobb (1857-1941), a graduate of Trinity College Dublin, was rector from 1900 to 1941. His controversial weddings including a blessing in 1938 for the singers Webster Booth and Anne Ziegler (Irené Frances Eastwood). The church suffered minor bomb damage during the Blitz in World War II. It was designated a Grade I listed building in 1950 and was restored in 1953. 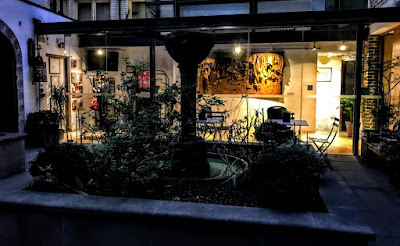 But in 1954, the church lost its parish to Saint Helen’s Bishopsgate and became a ‘Guild Church’ until 1991, when it became a ‘Chapel-of-Ease’ to Saint Helen’s and was used for storage. 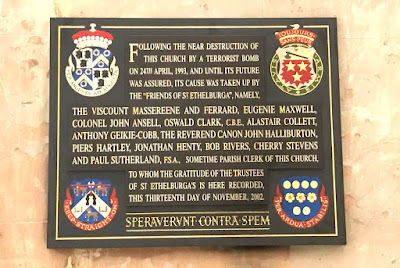 On Saturday 24 April 1993, the South Armagh Brigade of the IRA detonated a bomb in a tipper truck loaded with almost a ton of fertiliser and parked outside Saint Ethelburga’s. A coded warning was sent from a telephone box in Forkhill, near Newry, at 9.17 and the bomb exploded at 10.30, sending a high column of smoke above the City. The bomb targeted the surrounding commercial buildings, one person was killed, the photographer Edward Henty, and about 40 people were injured. The damage to the commercial buildings in Bishopsgate, including the NatWest tower – then Europe’s tallest building and now known as Tower 42 – was massive and eventually 500 tonnes of broken glass were removed. The damage cost £350 million to repair, and the pay-outs contributed to a crisis in the insurance industry, including the near-collapse of Lloyd’s of London. About 70% of Saint Ethelburga’s was destroyed. But the church was not insured, and most of the original fittings were destroyed by the bomb, as well as the work of Ninian Comper. There was considerable debate about the future of the ruins of Saint Ethelburga’s, with one faction in the Church of England proposing to demolish the church. But, after a sustained public outcry, it was rebuilt, though much changed internally. The tiny interior comprises a nave and aisle divided by an arcade. The mediaeval piscina and the arcades survived, along with the 18th century bell which was rehung. The front of the church was restored using 70% of the original wood and stone, the 1671 weathervane was put back in place, and Helen Whittaker designed a new stained-glass window depicting Saint Ethelburga, using fragments from an 1878 window. A new altar and lectern were made by Julian Humphries, using ancient timbers from the previous organ loft. The rebuilt church was renamed and was reopened by Prince Charles, and Saint Ethelburga’s Centre for Reconciliation and Peace began its work in 2002. 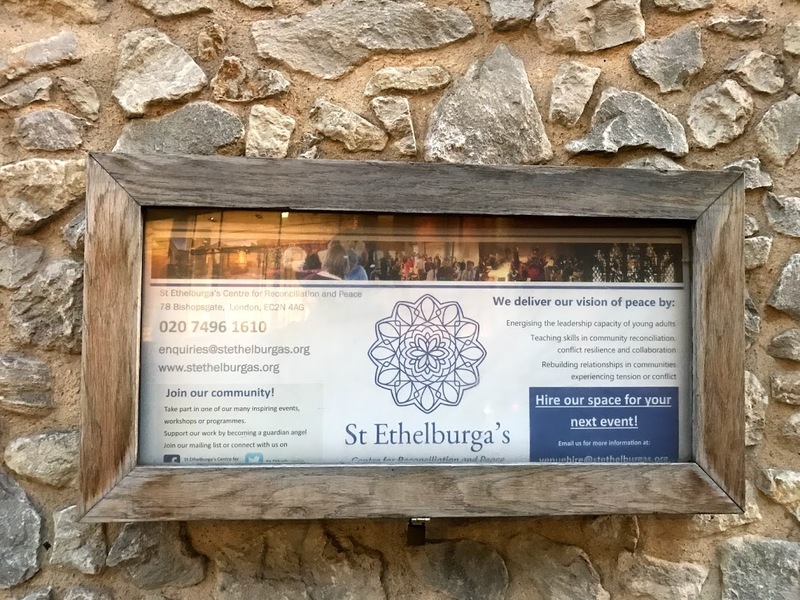 Today Saint Ethelburga’s is a ‘maker of peacemakers.’ It inspires and equips people from all backgrounds to become peacebuilders in their own lives and communities, building relationships across divisions of conflict, culture and religion, creating safe space for conversations and inquiry, increasing understanding and inspiring people to take action in their own communities. The centre values listening, reflection, honouring diversity, self-responsibility and non-violence. Over 8,000 people a year take part in its programmes and workshops. 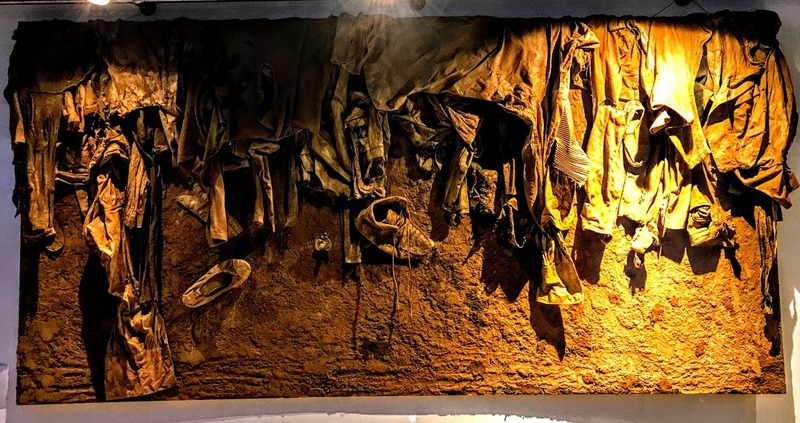 The current work includes a multi-faith conflict resilience programme, bringing together the North and South Sudanese diaspora communities in London, and using narrative and personal story to build empathy between people with different backgrounds. 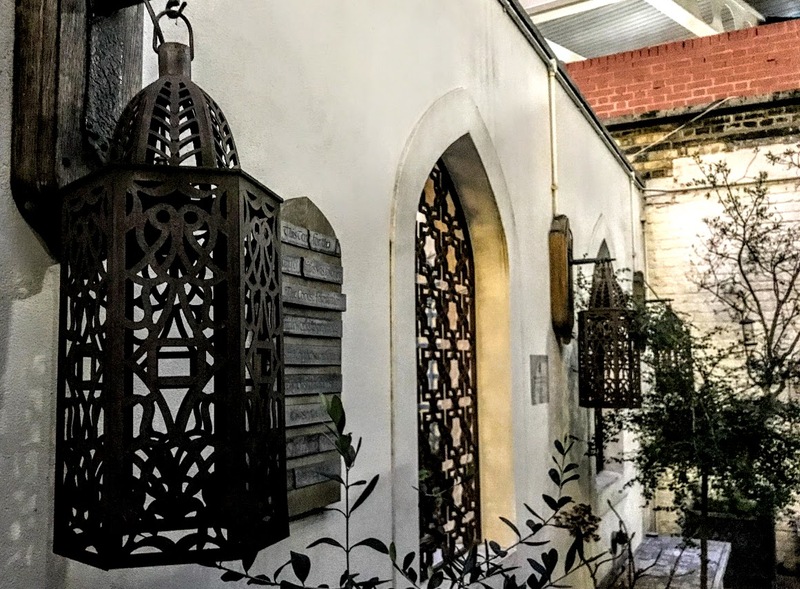 The centre also works with building empathy with refugees and re-awakening the sacred in bringing a deeper sense of meaning to the earth, environment, leadership, economics and business. Saint Ethelburga’s also runs an MA in reconciliation through Winchester University, a six-month leadership training programme for interfaith activists, and a three-day course in conflict coaching. 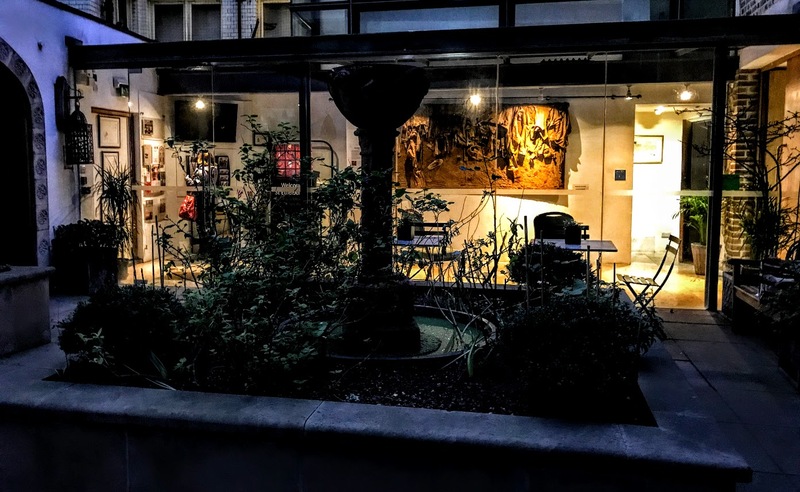 There are also programmes involving cultural exchange work, mentoring young adults, developing social action leadership roles and working with social enterprise. In the calendar of the Church of England, Saint Ethelburga’s feast day is on 11 October and the church holds a service around that time to commemorate her life. She epitomises a strong woman who exemplifies the virtues of leadership and commitment to social action, even to the point of self-sacrifice, that are encouraged in the centre’s programmes. Every year, the centre organises the Ethelburga Walk, a 14 km walk from Barking Abbey to Saint Ethelburga’s Centre. When Saint Ethelburga’s was rebuilt in the mid-15th century, it was the tallest building in Bishopsgate. 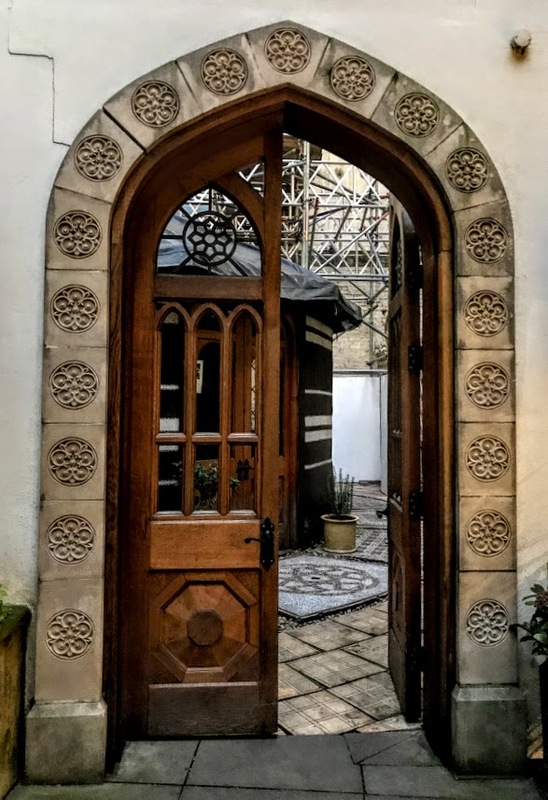 Now it is one of the smallest buildings on the street, and its diminutive mediaeval façade is dwarfed by the modern steel and glass structures around it, including the Gherkin and the tower at 99 Bishopsgate. But this church was here long before the stock markets and international banking arrived in the City. 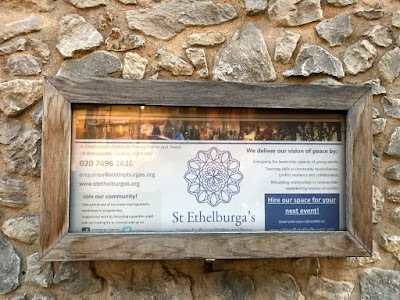 Saint Ethelburga’s represents not only the resilience of faith in the face of violence, but the power of faith in the modern world, and its new mission engages with some of the most pressing needs of today’s world. This feature was first published in the April 2018 editions of the ‘Church Review’ (Dublin and Glendalough) and the ‘Diocesan Magazine’ (Cashel, Ferns and Ossory).